This feeder has feeding ports on both sides and comes with both a pole and a hanger. A squirrel's weight on the perch closes the seed ports. All of the Absolutes now come with windows above the feeding stations. These clear, polycarbonate windows can't be damaged by squirrels. Powder-coated forest green finish. This is absolutely the best squirrel proof bird feeder I have ever used. I have three of them at my home. Squirrels get a tiny shock when they attempt to raid the feeder and, believe me, they only try it a couple of times before they give up. They don't get hurt! They just go elsewhere. No beaks, no feathers, no service. This birdfeeder reserves the right to refuse seed to pesky squirrels for uninhibited bird-watching all year round. The Super Stop A Squirrel Feeder is equipped with spring-activated ports that close under the weight of squirrels and large, uninvited birds. The feeder is designed with a heavy duty steel hanger for optimal stability, which is important considering this unit's 11-pound (2-gallon) seed capacity. The unit mounts to a 1/-1/4-inch pole with the included mounting clip (pole not included). 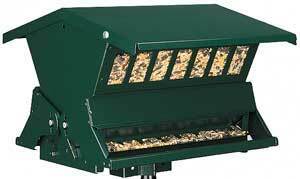 The feeder can also be post- or tree-mounted with mounting hardware included. A large seed window shows seed levels for timely refills. A removable seed bin means easy filling. Side/storm panels shield birds from wind, rain, and snow as they dine. Made of heavy-duty, rust resistant galvanized steel, this feeder is built to last. A durable forest green finish blends with the trees. Super StopASquirrel Feeder with heavy duty steel hanger included. Pole mount (up to 11/4 diameter poles) with mounting clip included (pole is NOT included). Can also be post or tree mounted with mounting hardware included. Stainless steel spring adjusts to deprive squirrels of feed and also restrict large birds by closing the feeding ports. Large, clear window to show seed level. Removeable seed bin for easy filling. Large capacity holds up to 11 lbs (2 gallons) of seed. Side/storm panels shields from wind, rain, snow. Made of heavyduty rustresistant galvanized steel. Durable forest green finish. HOW ABOUT A DO IT YOURSELF DEVICE? Works with any hanging feeder up to 10 lbs. The SquirrelStop® automatic spinning squirrel deterrent safely and harmlessly protects your hanging bird feeder from squirrels. When a squirrel climbs onto the feeder, the increased weight starts the SquirrelStop® motor, which spins the feeder and causes the squirrel to jump off. Squirrels soon learn to leave your feeder alone – and birds can enjoy their food undisturbed.